After several students fell off of the Utah State University radar in the recruitment process, some say it’s time to make some changes. No one is perfect. The recruitment officials for Utah State are no exception. Associate physics professor David Kardelis understand this but after two of his children fell through the cracks. He says something needs to be done to better the recruitment process. Now, two years later, Kardelis’ son is in a similar situation. “My son took the ACT and sent his ACT scores to Utah State Eastern and Utah State Logan, he hasn’t gotten anything.” Kardelis’ son has received a significant amount of information from other schools and universities in the region, but his local school has yet to reached out to him. “These students are sending in their ACT scores, they’re showing interest. Shouldn’t we be following up on that?” According to Kardelis, some other universities have been trying much harder than USUE. “SUU has been really pushing hard to get him.” They have sent him several pieces of recruiting materials and even a handwritten birthday card. Theatre professor Corey Ewan, Ph.D., has the same experience with recruiting his son who is a senior at Carbon High School. His son received a full-tuition scholarship from the University of Utah and recruiting material from several schools; none from USU Eastern or USU. This is an issue that has been brought to school official’s attention. 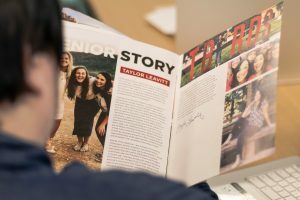 Recruitment is a key component to a college decision. One small thing can be the difference between one school and another. A lack of recruitment could be all the difference in the world. The major difference between recruiting in USU in Logan and USU Eastern is that Logan has a built-in identity. They could do no recruiting and still students would attend because everyone has heard of USU. They are always in the news for their sports and academics. On the other side of the coin. How many students and parents have heard of and know everything about USU Eastern? The answer to this question is reflected in the enrollment numbers over the past decade. As always, there are two sides to every story, including this one. In the next edition of The Eagle, The Recruitment office sheds some light on the processes they are taking to bring in our future students. Writer’s Note: As a student of USU Eastern, I found out about USU Eastern from the Internet. My high school was never contacted by USU Logan or USU Eastern. After my initial application process, I did begin to see some documents and information about the school. However, that all came after my decision to attend USU Eastern.